Scaling and Root Planing. 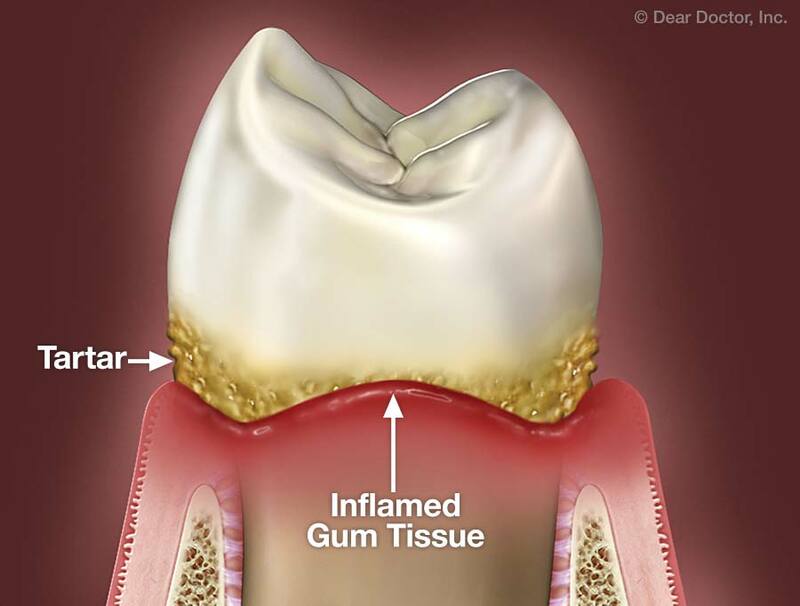 An important goal in the treatment of gum disease is to rid the teeth and gums of pathogenic bacteria and the toxins they produce, which may become incorporated into the root surface of the teeth. We do this with a deep-cleaning procedure called scaling and root planing (or root debridement). Scaling involves removing plaque and hard deposits (calculus or tartar) from the surface of the teeth, both above and below the gum line. Root planing is the smoothing of the tooth-root surfaces, making them more difficult for bacteria to adhere to. Antibiotics/Antimicrobials. As gum disease progresses, periodontal pockets and bone loss can result in the formation of tiny, hard to reach areas that are difficult to clean with handheld instruments. Sometimes it's best to try to disinfect these relatively inaccessible places with a prescription antimicrobial rinse (usually containing chlorhexidine), or even a topical antibiotic (such as tetracycline or doxycyline) applied directly to the affected areas. These are used only on a short-term basis, because we don't want to suppress beneficial types of oral bacteria. Bite Adjustment. If some of your teeth are loose, we may want to protect them from the stresses of biting and chewing — particularly if you have teeth-grinding or clenching habits. For example, we may carefully reshape minute amounts of tooth surface enamel to change the way upper and lower teeth contact each other, thus lessening the force, reducing their mobility. We also might join your teeth together with a small metal or plastic brace so that they can support each other, and/or make you a bite guard to wear when you are most likely to grind or clench you teeth. Oral Hygiene. Since dental plaque is the main cause of periodontal disease, it's essential to remove it on a daily basis. That means you will play a large role in keeping your mouth disease-free. We will instruct you in the most effective brushing and flossing techniques, and recommend products that you should use at home. Then we'll encourage you to keep up the routine daily. Becoming an active participant in your own care is the best way to ensure your periodontal treatment succeeds. And while you're focusing on your oral health, remember that giving up smoking helps not just your mouth, but your whole body. Often, nonsurgical treatment is enough to control a periodontal infection, restore oral tissues to good health, and tighten loose teeth. At that point, keeping up your oral hygiene routine at home and having regular checkups and cleanings here at the dental office will give you the best chance to remain disease-free.